The New Forest was originally created as a hunting area in 1079 by William the Conqueror. The New Forest is a highly desirable area to live and country houses and equestrian property are extremely sought after here. So why should you consider moving to the New Forest? The New Forest offers the best of both worlds from stunning countryside with pretty villages such as Beaulieu and Boldre to bustling seaside towns like Barton On Sea and Lymington. Whether you are looking for a Smallholding, Equetrian Property for Sale or something more coastal the New Forest has something for everyone. If you become a 'commoner' and own your own smallholding you have privileged rights whereby you can keep and let roam free your animals from pigs, geese, chickens and of course the famous ponies. Even if you don't fancy owning the animals yourself you can still take advantage of seeing these animals enjoying their freedom as you drive through the Forest but drive carefully, they're not up to speed on the highway code and will cross at whichever point they choose! If you are a keen equestrian there are miles and miles of bridleways, byways, quiet country roads and dedicated horse riding routes. There are also some excellent equestrian centres, The Burley Villa Riding School in New Milton is an excellent choice and caters for mixed ability riders. There is also an abundance of equestrian property for sale in the New Forest from equestrian smallholdings to larger, fully functioning equestrian centres with indoor and outdoor arenas, cross country courses and horse walkers. The New Forest is well connected. The main station at Brockenhurst is only an hour and a half to London Waterloo and under 20 minutes to Southampton Airport, Southampton Central and Bournemouth. The cost to commute to London is £5,716 per annum and parking at Brockenhurst is £850 per annum. On the downside this does make it desirable to the London buyer and country property prices in the New Forest are therefore quite high. Schools in the New Forest are excellent with a number of them achieving an OFSTED rating of 'Outstanding'. St Luke's in Sway & South Baddesley can both boast this accolade as well as for Secondary schools, Ringwood and Hounsdown. Many other schools achieve an OFSTED rating of good, most notably, Poulner, William Gilpin, Ringwood, Brockenhurst, Pennington, Burley and Bartley and for secondary, Priestlands, Noadswood, Applemore and Burgate. For private schools you have Moyles Court and Ballard School which are co-educational day and boarding schools from ages 2 to 16 years and Walhampton and Forres Sandle Manor both independent prep schools from ages 3 to 13. Depending on where you end up buying your country home, the sea is only a few minutes away. Lymington, is a very pretty Georgian town by the sea which has been named in the past as the best seaside town in Britian. 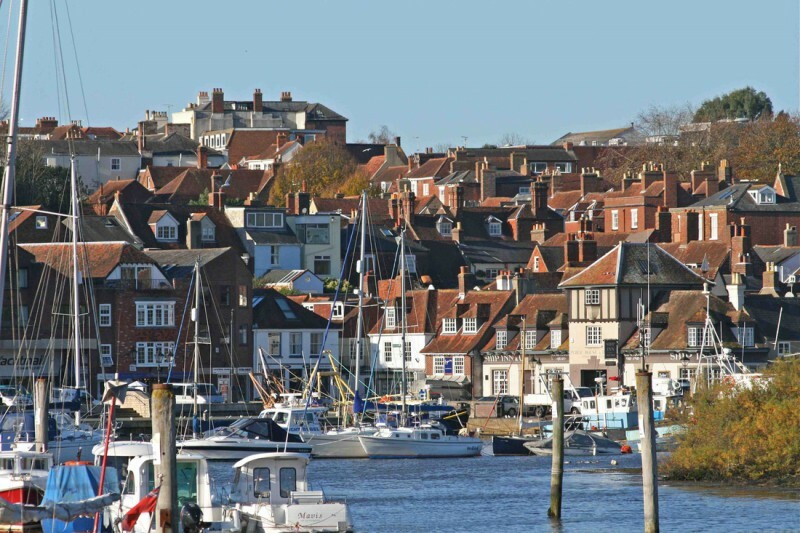 Lymington has two marinas and two sailing clubs and is excellent for all water sports and a spot of crabbing! The cobbled streets offer a varied array of cafes and shops and the charter market is held every Saturday and has over 90 stalls. Barton-On-Sea offers a fantastic golf club and magnificent coastal walks but if you want the hustle and bustle of a large seaside resort Bournemouth is only a short drive. If you're keen for your new country property or equestrian smallholding to be close to a good pub, the New Forest is the place to be! Country pubs are in abundance but if you are looking for a traditional pub, The Cartwheel Inn in Fordingbridge is outstanding and offers all the benefits of a country pub combined with delicious food and casks of ale from the local Ringwood Brewery. The Monkey House in Lymington is also a great find and offers home cooked food next to a roaring log fire. The New Forest is seen as one of the most important wildlife areas in the British Isles and is made up of three primary habitats, bogs, woodland and open heathland. 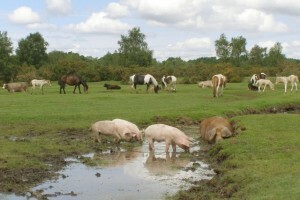 Many animals roam the New Forest including, cattle, deer and of course New Forest Ponies. There are many miles of nature trails through the New Forest to be enjoyed. The Central Crown Lands offer huge expanses of open heathland and mires whilst the Lymington-Keyhaven Nature Reserve is made up of fresh saltwater lagoons and saltmarches with stunning views across the Solent. Some of the finest arts and heritage museums can be found in the New Forest from Beaulieu where you can visit Beaulieu Abbey and the National Motor Museum, to The New Forest Centre, the perfect starting point for any visit to the area. All in all, the New Forest is just a beautiful place to live and purchase that stunning country property you've been dreaming of. Whether you choose to buy an equestrian property, smallholding or country cottage you will undoubtedly find the New Forest a great place to live. The convenience of the access to larger cities combined with the tranquillity of the beautiful New Forest and surrounding coastal areas is unrivalled. What's not to love? If you are looking to buy a country property in the New Forest and would like to speak with a New Forest Estate Agent visit our website foxgrant.com.